The Ford C-Max has seating for up to five passengers, and offers a surprising amount of cargo space. The C-Max utilizes a 2.0-liter four-cylinder internal combustion engine along with an 88-kilowatt magnet AC synchronous motor, to generate an impressive 188 horsepower. The C-Max can travel a total of 540 miles on a single tank of gas, making it the most fuel efficient vehicle in Ford’s lineup. The 2015 Ford C-Max comes in three different model options: The Hybrid SE, Hybrid SEL, and the Energi. Each model offers its own unique features and capabilities, sure to fit any lifestyle. The C-Max is one of the most affordable hybrid sedans on the market today, and features outstanding technology like the all-new next generation SmartGauge complete with EcoGuide. 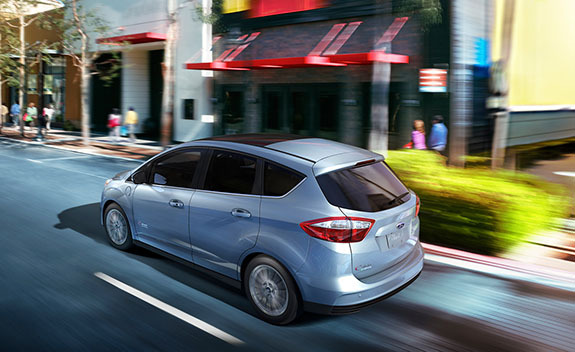 The 2015 Ford C-Max offers drivers three model choices, the Hybrid SE, Hybrid SEL, or plug-in Energi. Each model comes with a long list of standard features, all for an affordable price. The interior of both the C-Max Hybrid and C-Max Energi come with Best-In-Class passenger volume, seating for five, and features second-row in-floor storage compartments in the footwells behind the front seats. Check out each of the three models and what they offer below. SYNC AppLink provides Smartphone application access with hands-free voice commands. Works with iPhone and Android compatible mobile phones. Energi: The 2015 Ford C-Max Energi has a starting MSRP of just $31,770. The most powerful, most efficient of the Ford C-Max models, the Energi boasts a 2.0-liter Hybrid Electric powertrain, with a 7.6 kWh Lithium-Ion battery. This combination works together to deliver an EPA-estimated 95 miles per gallon in the city, and 81 miles per gallon on the highway. The Energi is the only one of the C-Max models to feature plug-in technology, for optimal driving distance between fill ups. What is most unique about the 2015 Ford C-Max Energi, is that plugging it in is entirely optional. The car can be driven without needing to be plugged in. Energi drivers will spend less time filling up, and more time on the open road. Drivers of the 2015 Ford C-Max will be catapulted into the future of automotive technology with the dual-LCD next-generation SmartGauge with EcoGuide instrument cluster. SmartGauge works to deliver a private coaching experience for driving efficiency, which can take time to master. Drivers can completely customize their display to their particular tastes and preferences. Brake Coach: This technology gives drivers visual cues on how hard to apply the brakes to optimize fuel efficiency. Engage Mode: Shows drivers different displays for engine power and lithium-ion battery power. The word “EV” is displayed when the vehicle is operating on lithium-ion battery power only. Empower Mode: When displayed, this mode provides drivers with all of the same information from the Engage Mode, as well as information regarding how close the gasoline engine on/off threshold is. The Empower mode also let’s drivers know the amount of power that is being requested by using the accelerator pedal. MyView: This unique viewing platform allows drivers to view two different levels of personalized information at the same time. Each one of the above modes can be easily accessed without lifting a finger off of the steering wheel, thanks to steering wheel-mounted controls. For drivers who appreciate a more visual driving experience, the right side of the cluster glows green and displays lush leaves and vines when driving efficiency increases. Purchasing a hybrid vehicle is unchartered territory for a lot of drivers. Ford recognized this when they designed and brought the C-Max hybrid sedan to market, making the experience as easy-to-follow and affordable as possible. Drivers will not only appreciate the initial cost-to-own MSRP of the C-Max, but they will also be saving money many years past initial purchase of the vehicle. The C-Max starts at $24,170, and the Energi C-Max tops out with a starting MSRP of only $31,770. Those initial prices are low for the hybrid vehicle segment, going one step further by saving drivers thousands in fuel cost years down the road. Federal and state government incentives drive the initial cost of the C-Max down even lower, making it truly an affordable sedan. Drivers will spend less time filling up their gas tanks, and more time out on the open road. Whether commuting to and from the office each day, or driving on a cross-country adventure, the 2015 Ford C-Max will allow drivers to do both, without breaking the bank.